→Looking for The Best Scope for Mini 14 Rifle? It’s Here! Looking for The Best Scope for Mini 14 Rifle? It’s Here! Are you going for a hunt but find it difficult to aim with your mini 14 rifles? A scope can solve this. But what should be considered when choosing a scope for this firearm? 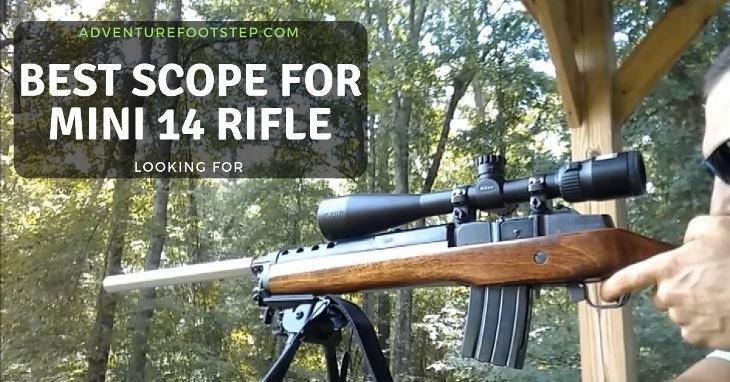 Learn more how to refine each shot better with this recommended scope for mini 14 rifles. The mini 14 rifle is the best utility rifle for casual shooting within 50 yards. It is still a good option among the semi-automatics, but its accuracy and reliability cannot be compared to those with 233 Remington cartridges. In short, mini 14 is not accurate without a scope. That is why you should consider getting one. If you properly scope this firearm, your point of impact could be reduced from 4 inches to about 1 or max 1.5 inches shooting 3-round groups. The mini 14 is not made to be an extremely accurate rifle, but with the help of good optics, you can shoot long range with more precision. The most important elements to look at before buying scopes for a mini 14 are durability, the magnification, objective lens, and reticle. 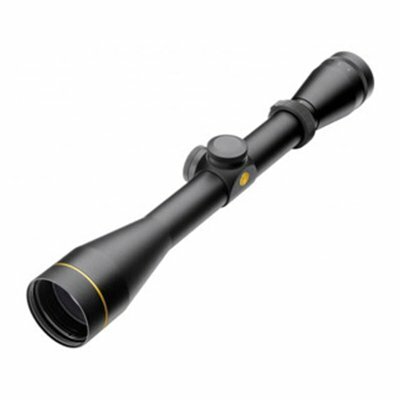 Most of the rifle scopes are made of aircraft aluminum for a light but durable product. However, there is also the polymer material which can protect the scope from wear and tear while maintain its lightweight. Both materials are waterproof. Besides, they can withstand rough conditions and all kinds of weather. But the aluminum is still the popular choice because most people like the firm feeling when holding a gun, which polymer cannot provide. Besides the making material, the ability to resist against water is also decided by how the scope is mounted. 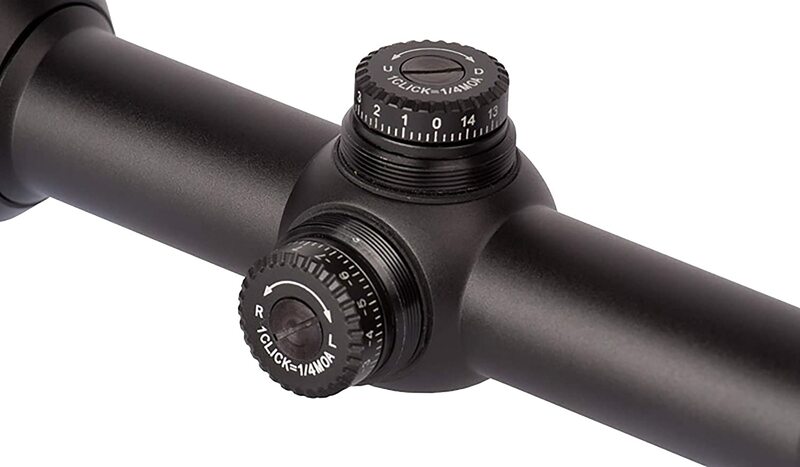 An O-ring mounting is the best to prevent the water from leaking into the scope. And the optics has to be filled with nitrogen gas to keep the lens clear. Without the gas purged into the optics, the humid air can get inside the lens, forming fog on both inside and outside of the lens. There are two lenses at two ends of the riflescope. The one closer to your eyes is called the ocular lens and the other, closer to the target, is called an objective lens. Both of the lenses should be waterproof, and fog-resistant to produce the best image of the target. They should also be big and high to allow more light to go into the lens, thereby producing clearer images. And because glass can reflect some light, a synthetic coating outside the lens would reduce unwanted glare. Because the shooting range of mini 14 rifles is not that far due to the large bullet trajectory, low or medium power lenses are enough (around 4x to 10x). The bigger the number is, the bigger picture is magnified. For example, if you adjust the power ring to 4, it means that the target image is zoomed 4 times bigger when looking through the scopes. On the lenses, there are some markers indicating where your bullet will hit on the target when you trigger the gun. The types of marks vary based on different shooting occasion. The eye relief is the most ideal distance from your eyes to the eyepiece of the scope. This number tells you where you should put your eyes to get the best image through the scope as well as to protect your brow and face from recoil. For riflescope, the number should be above 3.5 inches. Most of the rifle scopes are designed to have the main focus at 100 yards; however, when you adjust to larger magnification, it will increase the parallax error. Some of the scopes have an adjustable objective lens that can reduce this error. 1-inch thick in the main tube, 12.4 inches long and weight only about 17.1 ounces, the Nikon P-223 has many features that make it one of the top choices of scope for mini 14. As a part of the P-series scopes designed for AR rifles, P-223 has an amazing lens and magnification. The lens is 40mm in diameter, which is quite large for a medium range rifle. The bigger lens produces a clearer and brighter image of your target. Boasting a 98% light transmission, the scope allows you to see a clear image even when there is little light. The big magnification range (3x-9x) provides a larger image. With such ability to zoom in, you don’t need to get close to the target while hunting. The bullet drop compensation or BDC 600 reticle of Nikon P-223 reduce the bullet’s trajectory and increases the effective shooting range to about 600 yards. It works best with a 55-grain polymer tip bullet. Made from the polymer, it is lighter than the metal scopes but can withstand all weather conditions. The optics are also filled with nitrogen and sealed in an O-ring, making it totally waterproof and fog proof. Featuring Spot on Wind Meter, this scope supports you to aim the correct target location at different distances, thus increasing the shooting accuracy. This scope has all the features that can considerably enhance your hunting experience with the mini 14. It is proof against many types of weather conditions like rain and fog. With a diamond-coated lens, the optics can remain undamaged even over a long time in use. Filled with Argon gas blend, the scope is protected from thermal shock. The original Index Matched Lens System reduces the light scattering and reflection. Therefore, the Leupold scope can provide sharp, bright, and high contrast visual over the whole field view, even in poor light condition. Especially good for hog hunting, the duplex reticle allows you to aim and measure better. The finger-click ¼ MOA adjustment assists in target spotting. The 3:1 zoom ratio erector even enables you to go from big pictures to fine details. And another cool figure is the custom dial system or CDS. You can quickly dial the elevation to achieve zero at different ranges. With numerous great features, it still maintains light (around 11.2 ounces) thanks to the aircraft-grade aluminum material and the 1-inch tube. Like most other riflescopes, the Vortex Crossfire II is made of aircraft-grade aluminum, the durable and shockproof material. However, it weighs up to 19.2 ounces, which is quite heavy compared to others in the same category. It is O-Ring sealed, which means you can use it even in rain thanks to its waterproof nature. The nitrogen fill prevents fog forming on the lens. Moreover, it is also shockproof against the impact pressure of heavy rebound. With this optics, you can magnify the target image 2 times to 7 times bigger, which should be enough when you do short and medium range shooting. 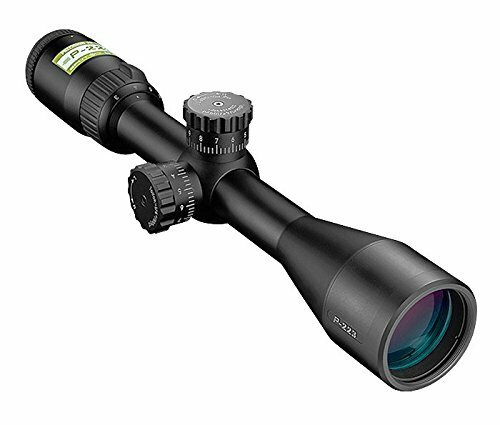 Accompanied by a second focal plane (SFP) that allows the size of reticle to stay the same while the magnification increases, the scope can give users clearer images. The objective lens is 32mm in diameter, anti-reflective and multi-coated, which ensure precision when aiming as long as the target is bright and clear enough. Besides, the long eye relief about 3.9 inches and big eye box, you can acquire the target faster. The special feature dead-hold BDC reticle allows you to shoot better without guessing how long the bullet can hold in the air before it is affected by gravity or wind. While there is a wide variety of products in the market, considering design, utility, and quality, the Nikon P-223 is the best scope for a mini 14. Made by a famous manufacturer of lenses and scopes, the Nikon P-223 is fully equipped with the waterproof and internal fog proof lenses, a wide range of magnification and perfect eye relief optics. It also features the BDC reticle and wind meter to acquire target more quickly and precisely.